April 26, 2010 - International Launch Services (ILS), a leading launch services provider for the global commercial satellite industry, successfully carried the SES-1 satellite directly into geostationary orbit Saturday on an ILS Proton for SES WORLD SKIES. 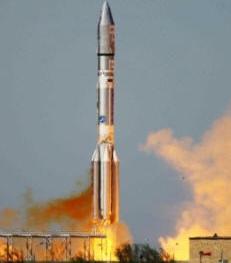 This was the third ILS Proton launch and the fifth overall Proton launch this year. The SES-1 satellite was also the 22nd consecutive successful Proton launch in 21 months. The ILS Proton Breeze M launched from Pad 39 at the Cosmodrome at 5:19 p.m. Saturday local time (7:19 a.m. EDT, 11:19 GMT). After an eight-hour, 58-minute mission, the Breeze M successfully released the SES-1 satellite directly into geostationary orbit. This was the 356th launch for Proton since its inaugural flight in 1965, and the 59th ILS Proton launch overall. The Proton Breeze M launch vehicle was developed and built by Khrunichev Research and Production Space Center of Moscow, one of the pillars of the Russian space industry and the majority shareholder in ILS. The SES-1 satellite was built on Orbital’s space-proven Star 2.4 platform and will replace SES’ existing AMC-2 and AMC-4 satellites at the orbital position of 101 degrees West. SES-1 is an integral part of SES’ satellite replacement program over North America. The spacecraft carries 24 C-band transponders as well as 24 Ku-band transponders of 36 MHz capacity each and has been designed to have a minimum expected service time of 15 years. Khrunichev, which holds the majority interest in ILS, is one of the cornerstones of the Russian space industry. Khrunichev manufactures the Proton system and is developing the Angara launch system. The Proton launches from facilities at the Baikonur Cosmodrome in Kazakhstan, and has a heritage of over 355 missions since 1965. Khrunichev includes among its branches, a number of key manufacturers of launch vehicle and spacecraft components in Moscow and in other cities of the Russian Federation. SES (Euronext Paris and Luxembourg Stock Exchange: SESG) wholly owns the market-leading satellite operators SES ASTRA and SES WORLD SKIES, and participations in Ciel in Canada, QuetzSat in Mexico as well as a strategic participation in satellite infrastructure start-up O3b Networks. SES provides outstanding satellite communications solutions via a global fleet of 41 satellites in 26 orbital locations.